In this book, dedicated to both her children, Leila re-tells stories she heard as a child in a Jewish household – legends from before the Old Testament existed, but which had since become incorporated into it. Leila’s original vision for the book was that it would be a lavishly produced and artist-illustrated volume in a “coffee-table” format, but she was unable to get any publisher to see it that way. In the end it appeared in a standard and un-illustrated hard-back form like a novel. Her original title was “The Book, The Cloak, and The Sapphire Sword”. When this was changed, against the publisher’s advice, an unanticipated consequence was that bookshops placed it on shelves labelled Religion. In fact the appropriate shelf was Myths and Legends, as Leila’s intent was to rescue the stories from their later religious adaptations. For these and other reasons definitely not linked to the quality of her writing, it was her least successful book in terms of sales. She had spent years researching the original material for what turned out to be her last published book, and the stories contain many features obliterated from the later Biblical versions. I wrote this book primarily because I wanted to give back to people the folk tales and legends which religious institutions and people in power, by dogmatism and manipulation have taken away from them. 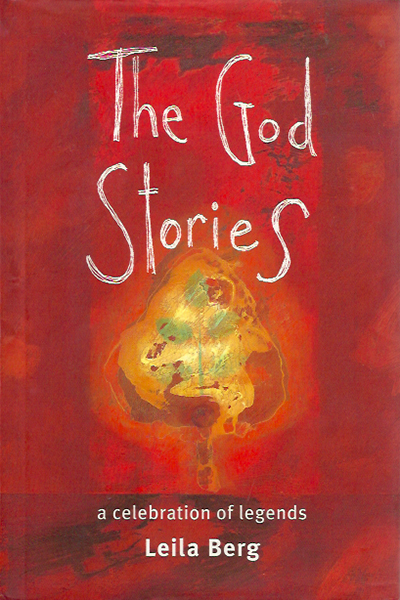 The God Stories is a book of legends for people aged nine to ninety, who are captivated by stories. I hope they will read it on the train on their way to work or back, or relax with it after school; and that parents and children, grandparents and grandchildren, will read it aloud to each other for shared pleasure, as they read other books of powerful stories, enjoying the unaccustomed words, and the phrases, and the cadences. 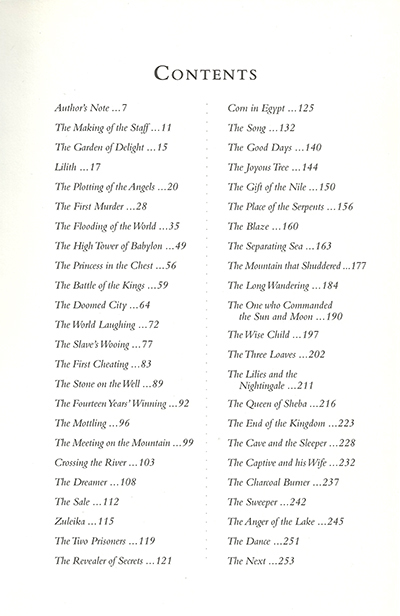 It is a book for storylovers and storytellers. Almost nobody reads the Old Testament voluntarily, for pleasure, today – the institutional layout, the notes, the pious paper and binding, the moralistic associations. I wanted to make a book of stories rooted in the Old Testament that would exhilarate everyone, not by taking away its poetry, a modern idea which is to me absurd, but by first taking away the religious and political and sociological manipulation; and then building not only on the stories themselves, but on the loving, fanciful improvisations that through centuries have been woven by learned and unlearned people, over them – rather like jazz. 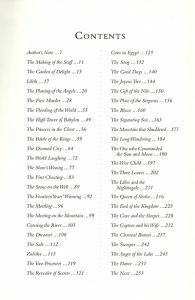 Early in my research I came across a Staff, a Staff of sapphire, blue as the sapphire sky – a Cloak, which had pictured on it every animal, bird and insect in the world – a Book, that had in it all knowledge worthy to be told, including the song of the sun and the thoughts of the rain. In legend these gifts were given to Adam and Eve to protect them when they left the Garden of Delight, and then handed down through the ages. I decided to make them my framework, and to write the book only about the characters who in legend had been given them. Following Jewish folklore, I made God male and female together, and the first human being male and female together, since it was made in God’s image. It was also in legend made all colours, so that it could live happily and freely anywhere in the world. And the earth in legend belonged to God and was to be respected. Today we call that respect for the environment. So many things in these legends are things we are talking about now. That is how myths are. When God made the first human being from a handful of earth, air, fire, and water, a man-and-woman-in-one who was meant to live for ever, what then? And when at the creature’s demand God divided it into two separate equal halves, and the Woman, Lilith of the long unbraided hair, left the Man because he would not accept that they were equal, what then? And when the Man demanded another Woman, so that God made him a smaller one with hair tamed and braided, who would do only as the Man wished, what then? Then they had to leave the Garden of Delight, and God gave them three gifts – a Staff blue as the sapphire sky with on it one word, All-That-Is; a Cloak picturing every animal, every bird, and every fish they had named; and a Book that had in it the song of the sun and the thoughts of the rain and all Knowledge that was worthy to be told. And what then?